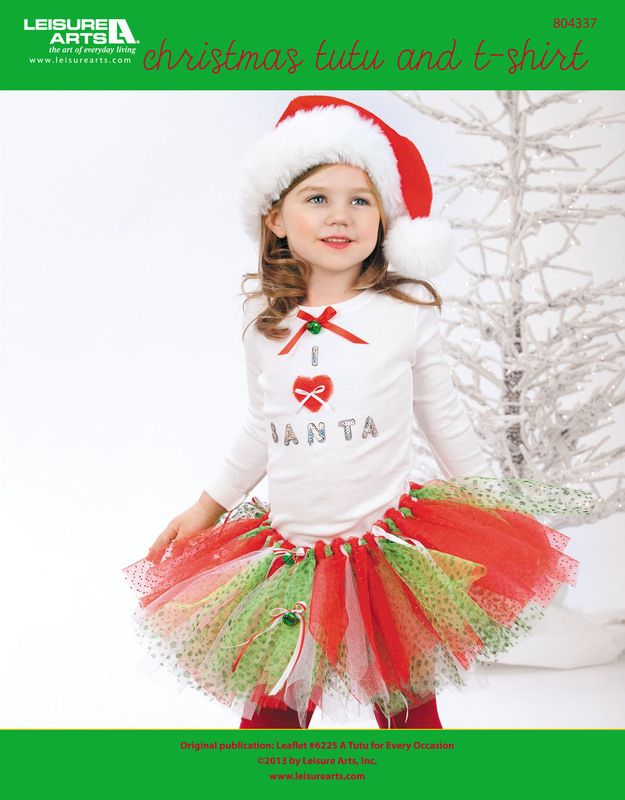 On the ninth day of our 12 Days of Christmas Giveaway, my true love gave to me…the Christmas Tutu and T-Shirt from Leisure Arts! Note: Our model is wearing a 10” long tutu. Refer to the General Instructions when making the tutu. 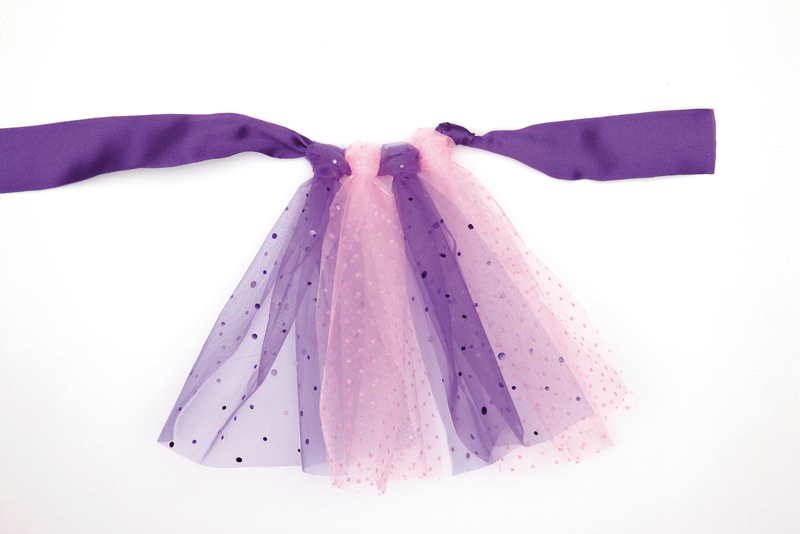 For the tutu, use tulle to make a Basic Tutu, alternating the colors as desired. Cut the white and red ribbon into six 15″ lengths. Holding one of each ribbon together, tie a bow, catching a bell in the knot. Tie six bows. Glue the bows to the tutu as desired. For the T-shirt, trace the heart pattern onto tracing paper and cut out. 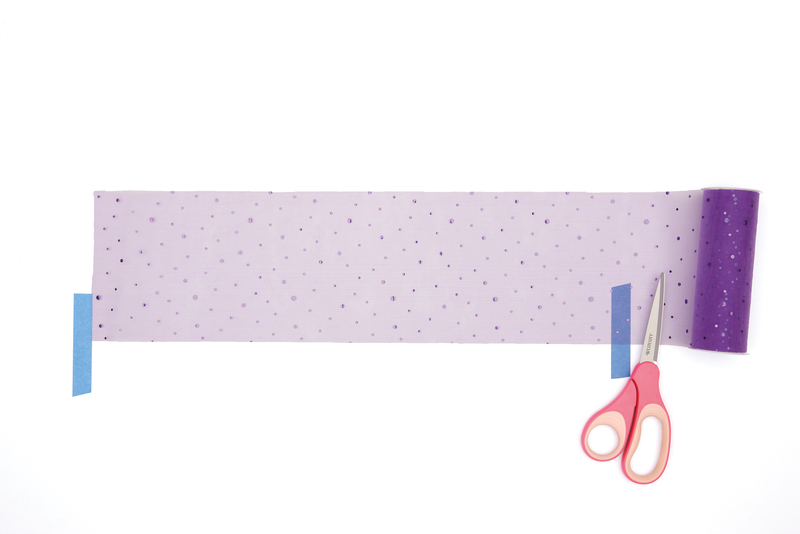 Use the pattern to cut eight tulle hearts. Stack the tulle hearts and securely tack together at the center. 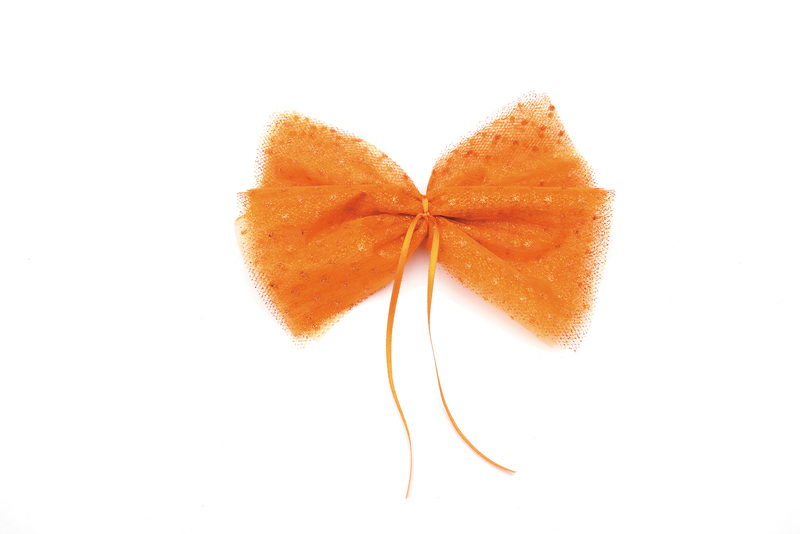 Tie the white ribbon into a bow and tack to the tulle hearts. Tie the red ribbon into a bow, catching the bell in the knot. Arrange the red bow, letters, and heart on the T-shirt. Follow the manufacturer’s instructions to adhere the letters; tack the bow and heart to the T-shirt. These tutus are quick and easy to make. Because they tie on with ribbon, they’ll fit sizes 2 to 8. You just need to decide the finished length, either 10″ long or 18″ long. Complete tulle and ribbon yardages for each length are given with each project. To make the basic tutu, you‘ll need 11/2″ wide ribbon for the waist tie, 6″ wide tulle on rolls (see individual projects for colors and amounts), tape measure, and scissors. 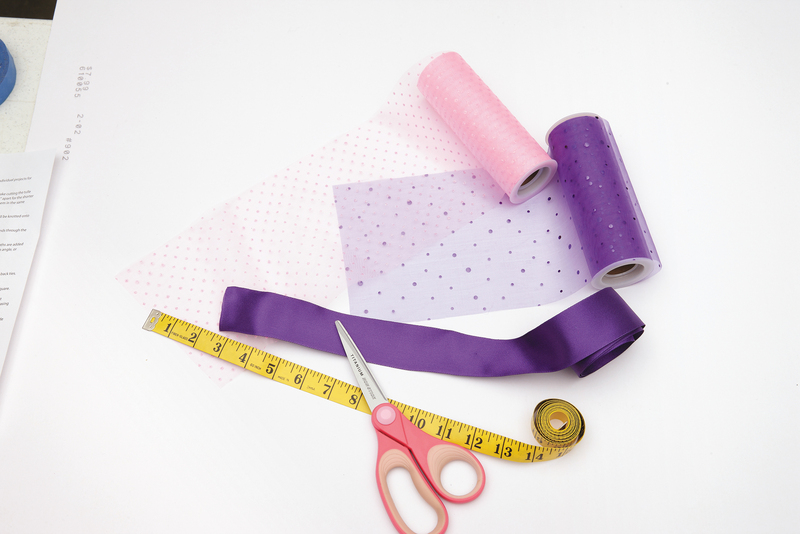 To make cutting the tulle lengths easier, mark the work surface with tape pieces placed 20″ apart for the shorter tutu or 36″ apart for the longer tutu. 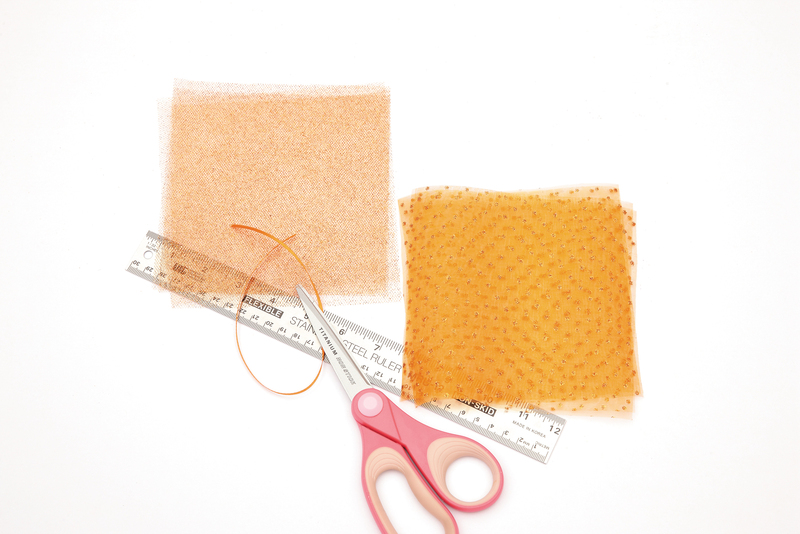 Cut tulle strips the determined length. If you are using ribbons in your tutu, cut them in the same manner. 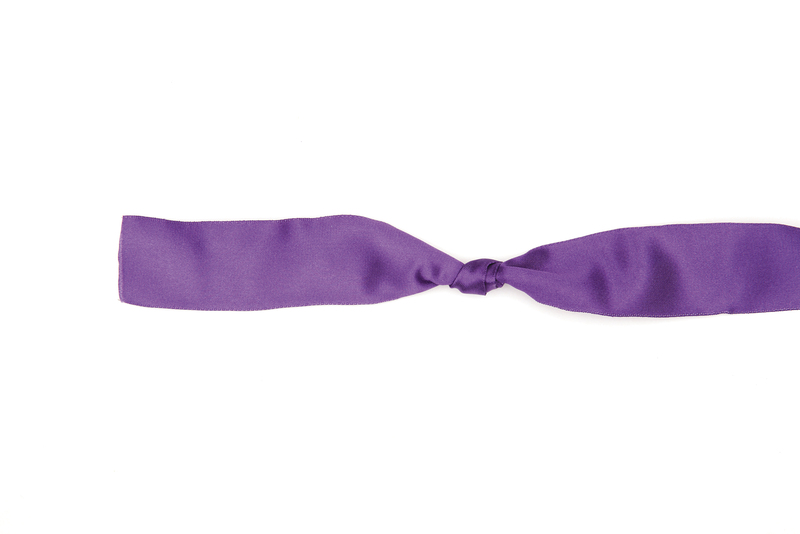 Tie a double or triple knot about 15″ from each end of waist tie. The tulle and ribbon strips will be knotted onto the waist tie between the knots. Fold a tulle length in half. Bring the tulle ends around the waist tie close to an end knot and pull the tulle ends through the loop. Pull the knot snug. Continue adding tulle lengths, pushing the pieces close together on the waist tie. 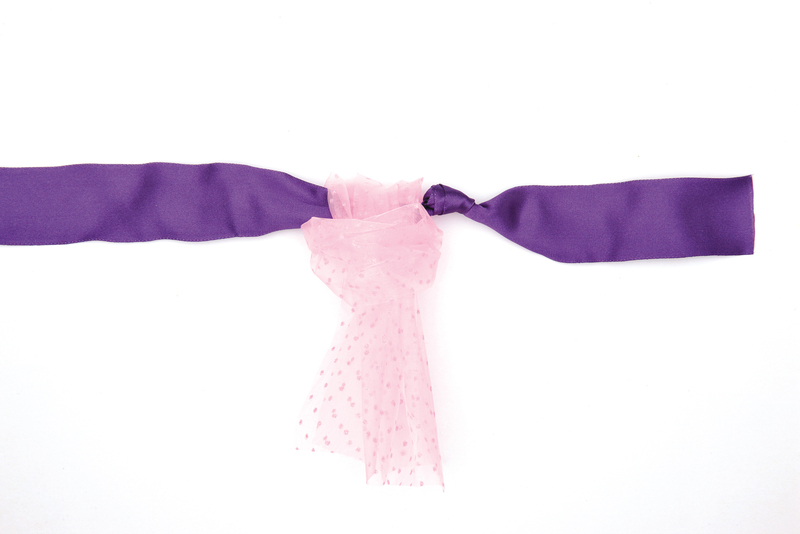 Ribbon lengths are added in the same manner, placing them between the tulle strips. The tulle ends may be knotted, trimmed diagonally, or trimmed to points. To make the basic tulle pom-pom, you‘ll need a 12″ length of 1/8″w ribbon for the tie, 6″ lengths of 6″ wide tulle (see individual projects for colors and amounts), ruler, and scissors. tulle pieces. Securely tie the center with the ribbon. 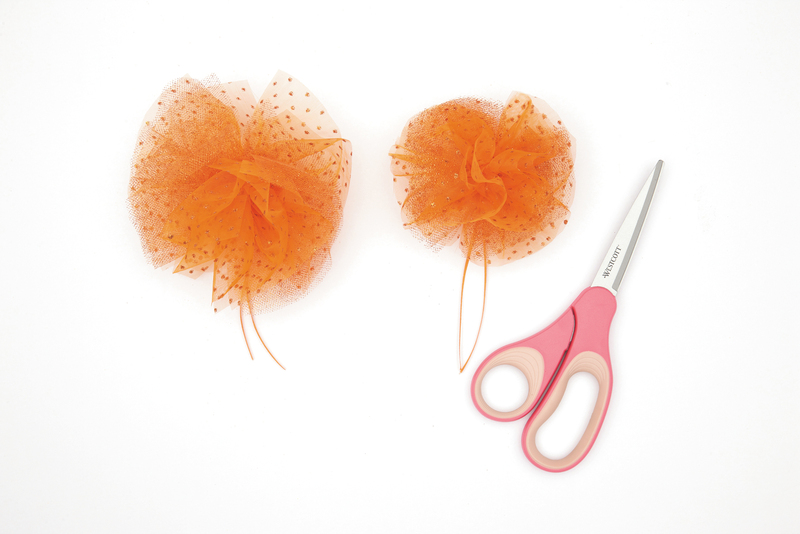 Being careful to not cut the ribbon ties, trim the pom-pom to the desired size. 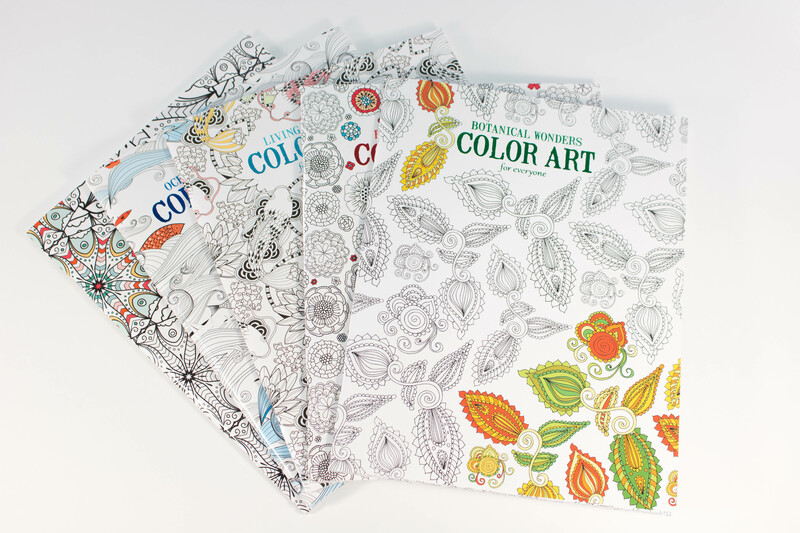 Enter to win a prize bundle from Leisure Arts including five adult coloring books. Often a great way to relieve stress and to relax, coloring is a fun activity for all ages. These coloring books feature advanced designs for adults, and the pages are so beautiful, they’re all works of art! What do you do to relieve stress or relax during the holidays? Winner will be announced here on the blog December 14, 2015 as well as contacted by the email address provided. You have until December 11, 2015 at 11:59pm EST to leave your comment on the project above. Comments posted after that will not be counted. This Contest has ended. Check out the rest of the 12 Days of Christmas series. There are still 3 chances to win! You’ve won the Leisure Arts Adult Coloring Books! depending on the time of day or night makes a difference for me. I like to get outdoors for a short walk to clear my mind, in the fall/winter it’s more enjoyable living here in FL. i love to crochet! I like to keep my hands busy to help with the arthritis starting in my finger joints. The more I use them, the less pain. I also love to read. I like to drag out my beads and findings and create a “jewelry storm” Just let my worries and stress turn into something beautiful. Besides, when I get into it I can think things out and I usually come up with solutions to my stressors. I ride my bike, an hour or so on the bike path does wonders. As a caregiver, it’s always difficult to relieve stress any time of the year and the Holidays are no different. I try to unwind every evening and relax with a good book or movie but before that I make sure my next day is already set up ahead of time…pay bills, clear out emails and correspondence etc so the morning is a fresh start. I turn on some music & bake goodies. I crochet or read. Both hep me to relax. Plus crocheting helps me get gifts made! I listen to Christmas music and knit on my lace Advent scarves. I will sit down and crochet or sew. My little Crocker Spaniel is usually at my feet waiting to go for a walk which is another way I relax. We go to the park and walk or she plays with the other dogs. You just need to get out of the house sometimes and enjoy the beauty. I drift off to a room by myself and crochet with some yarn that I keep in my purse. The outfit is so cute. My little girl is now a teenager but it would have been fun to make it for her when she was little. I spend time in my craft room to relax and de-stress during the holidays! It always makes me feel better to create something! LOVE this project and plan to get the items to make it!! My 3 year old granddaughter is going to love it!! Thanks for the inspiration! I like to go on a hike. It’s so peaceful and really makes appreciate everything. Crafting always relieves stress for me! I like to relax with a cup of tea and a book. I love to read a good mystery book and take my mind off of my worries! I enjoy reading, knitting, and just recently started colouring adult colouring pages, all three are very relaxing for me. Thank you for allowing me to enter this contest. I like to take a break and go read a book in my room. Spending time with God, meditating, praying, hot bath/shower, and a cup of tea are ways I relax! I have a cup of tea and some quiet when I am feeling stressed. Would love to win a Christmas prize. I have been knitting for 40+ yrs now. I also do a little sewing, cross-stitch & plastic canvas. I bake christmas themed desserts! I like t be outside and seeing all of the area light displays. I relax by sewing quilts in my free time nd then at night I color in regular coloring books. It is so relaxing. I have not tried the adult coloring books yet. I have looked at them in the stores and they look pretty cool. I would love to win the adult coloring books from Leisure Arts. I like to write and have a cup of coffee outside on my deck. I sit in the recliner and listen to Christmas music. Music is such a soother! Relaxing baths and glasses of wine! I love to read….anything, magazines, books, newspapers, blogs, anything. Gives me a chance to take my mind off all the hurrying and scuttle of the all too fast holidays. Plus, it may give me more ideas, yay! 🙂 I love the holidays!!!! I love having my coffee on the deck in the morning, and watching the birds. I like to shut off the lights, except those on the Christmas tree, turn the gas fireplace on, sit in my recliner covered with a fleece blanket, drinking some hot tea with honey or if I’m really stressed, a glass of wine. Just looking at the tree with no other distractions is very relaxing. I always go out for a walk, even if it’s just up and down the driveway! I do crossword puzzles to calm down and de-stress before bed. I love to read but usually while multi-tasking, but I have recently started carving out this bit of crossword time in the evenings. I cook to relieve stress. Lovely tutorial thank you for sharing. I relieve stress by spending time alone and turning off the news. I read and have a cup of hot chai. Truthfully, I drink some liquor. I read books but if I win this giveaway, I will be coloring! I draw and color to relax! Watching a good movie is an escape from stress. I go and take a walk in the park. No matter how crazy, busy I am, During my morning coffee, I do absolutely nothing. I hold my cup up close to my face so I can smell my coffee, stare off into space and make everyone else wait till I’m done doing nothing. I heart to lift weights! I knit, crochet or do needlework, and when there are others around, we play board games: Scrabble, Monopoly, Yahtzee, Risk and Clue. to de-stress from preparing for Christmas, I S-E-W while watching (or listening to) Christmas movies!!! That is the most relaxing thing that I can think of to do. I start birthday gifts, for January and February birthdays. What a relief from Christmas sewing; which I usually start in June or July. During the Holidays I relax by me time at Crocheting and watching The Hallmark channel…we can’t have a big Christmas this year I have been out of work due to my health had to have back surgery n I may never walk again so I try to find things to relax with..my Crocheting helps but I would lovevthe chance to win the coloring. I have just recently started crafting. I need projects that don’t require finger dexterity! To relax, I draw, read, or watch a movie. Aw heck, I NAP ! I like to sew or quilt. I take several breaks to take a walk with my dog to enjoy the her and the outdoors. During the day I “borrow” a dog or two and go for a long walk. They are great listeners and a cuddle when I sit down is usually enough to ease whatever is bothering me. If its evening I usually soak in the tub with a book or magazine. On Thanksgiving Day and Christmas Day when I want to escape I go to the Zoo (its free on those days) and it is a way of getting away from the hecticness of the Holidays. I like to drink……preferably with a few close friends or sisters. I spend time playing games with my husband and children to relieve stress during the holidays. I watch movies or read my Bible to relax. I like to escape in a good book. I TAKE A BUBBLE BATH WHEN I REALLY NEED THAT ME TIME TO WIND DOWN FROM DAILY STRESSES..
Watch a Christmas movie and crochet . Good Luck Everyone !!!! I make sure to get all my shopping done early, so I don’t have to deal with the crowds. Thanks! Bake and bake and bake some more! Take that down time while things are in the oven to giggle with the kids. I like to read to relax, But during the holidays, I really enjoy watching Christmas movies while sitting by our lighted, decorated Christmas tree. Get down on my knees and thank the Lord for being blessed to be have life. I know my life may not be perfect but someone is worse off. I’m blessed. I play music Christmas music on the piano. I exercise if possible. I know that doesn’t seem relaxing but it gives me time to clear my head and after I take a hot bath and use essential oils for my muscles. I try to escape with a good book or magazine. I relieve stress by not celebrating the holidays. Any time of year, I knit or read to relax. In times of most stress, those are the most helpful. Except now, when the stress is that my wrists hurt way too much to knit or crochet. Maybe I could win this prize and spend my time coloring. Wheeeee! I turn off the phone and sleep. That’s my favorite! I take my dog for a walk or go to the dog park. My little buddy always puts a smile on my face. I love to relax in my recliner with my knitting while hubby watches television. I like to read and always take a book with me if I have to wait somewhere. I like to read in my sunroom with a cup of tea, when I can find the time. I always de-stress by doing yoga. I am always so busy during the holidays, and it is the only thing that calms me down. Make a cup of sleepy time tea, and grab my soduko book and a pen, after a nice hot shower, then curl up in my nice warm waterbed, with the radio playing softly in the background. If I can’t do that because the grandkids are here, then we make some hot chocolate and cuddle up on the sofa for a relaxing movie together. I like to watch movies in bed to relax. I crochet, and if that is proving more stressful than my stress…I actually color in an adult coloring book I got as a gift. I usually read or edit my photographs to later use in scrapbooks or cards. The last comment was mine. I read or edit photos. I had a typo in my last name. I take a nice warm bath to relax, thats my way of having me time and taking it easy. I binge watch tv series on Netflix to relieve stress. Talking on the phine with a good friend while curled up in bed. I leave near the beach and intercoastal waterway, so when I get stressed, I like to drive over and take a walk on the beach or go out on the dock with my hubby and do a little fishing. Walk around my neighborhood and enjoy the lights and decorations. I read a lot and work word puzzles and I love to color but have needed some new books for a few years now. Would love to win these as I already have lots of crayons and markers just waitiing to be used. I knit and do other creative things. I watch the movie “A Christmas Story” to relax! That is all I can say is CUTE!!!! I watch holiday movies and bake pies and cakes. There is noting better than crochet to relieve me!! I don’t really have any stress. I just don’t get myself worked up over anything. I have a 3 month old, a relaxing bath while my husband watches the baby is my destresser. I like to colour and go for walks. I relax by listening to Christmas music and by watching Christmas movies. I try to relax by the Christmas tree and listen to Christmas music and bake! I love to read and crochet. Reading helps the most because my mind is occupied by the story line. to relieve stress or relax during the holidays I sit in the hot tub! This craft looks doable even for me. Thanks for sharing! Sit down with a glass of warm apple cider. Watch all of the Christmas movies that are available on TV or cable , old or new ones, it doesn’t matter, as I enjoy them all. I take long candlelit bubble baths! I read, listen to music, sew or do creative arts/crafts or simply color. When I’m stressed or not, I have to be busy with my hands and divert the stresses to movement. Simple things that don’t require a lot of thinking….. I make cards. It keeps my mind off the pile of to do’s I have! Make a cup of tea and turn on Christmas music! I try to get naps when I can. I go away for a weekend with my girlfriends over the holidays. We manage to do some shopping but mostly just enjoy each others company and many laughs. I either bake or crochet! I love to have a hot buttered rum to help relieve stress. The cinnamon smells great as the warmth spreads through you and your cares fade away, at least for awhile. I paint and knit to relieve stress and relax during the holidays. I like to read, color and watch TV to relax. I would love to win some of these coloring books. To relax during the holidays I shop on line and have cut my present list drastically. 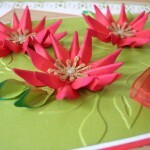 To relax, I like to read, create cards, crochet or cross-stitch. I sit down with a bowl of popcorn and watch one of my favorite Christmas movies on DVD like Miracle on 34th Street or Christmas Vacation. I exercise and pamper myself. I’ve loved coloring since I was a kid. I printed a bunch off pinterest and have colored all. It’s very hard to find books in the stores. I’ve resorted to kids books. I’d love to win these. They are indeed relaxing and stress relieving. I like to color and craft!! I am a single mom with three kids, one in college and my youngest has Down Syndrome. Oh and right at this moment my dad is in ICU. So i need to relax, thats why i am up at 147 am. Lol. My favorite way to relax is to crochet, i even take it to the hospital. I also hardly ever watcb tv so i am always crocheting for stree relief. I knit while watching some tv! I listen to Christmas music and read to relax. I started doing this earlier this year when I was healing from each of my three sugeries I had. Now I’m hooked and have introduced this to several of my co-workers.